Jashon Cornell played in five games during an injury-plagued redshirt freshman season in 2016. He redshirted the 2015 season as a true freshman after initially enrolling at Ohio State in January 2015 in time for the start of the spring semester … he is majoring in family resource management … Cornell was one of the highest rated prospects in his Ohio State class, with No. 7 strong-side defensive end ratings virtually across the board and Top 100 overall status by ESPN (No. 33), Rivals (No. 14) and 247Sports (No. 88) … a consensus 4-star prospect who was regarded as the No. 1 prospect in the class of 2015 by ESPN prior to his junior season … he twice was named a second-team Minnesota all-state pick by the Associated Press … the No. 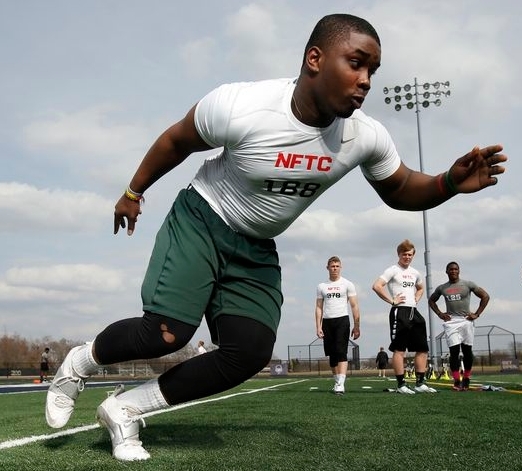 1 defensive end in the Midwest according to Scout … the defensive line MVP of the Nike training camp in Columbus in the summer of 2014 and thus earned an invite to The Opening later that summer … capped career at the Under Armour All-American game … is from the powerful Catholic high school on the west side of St. Paul that has produced outstanding athletes like Joe Mauer, Michael Floyd, Chris Weinke and Steve Walsh … he committed to Ohio State on July 2, 2014 … is the son of Sheena Cornell.